Hi Babes! Obviously I don't get one here much lately. I've been dealing with a lot health-wise and just haven't been able to bring myself to post anything for quite a while. After I was sick, I planned to do a post sharing my story, but after a while I just got so exhausted with all the appointments, talking about it, thinking about it.... I just couldn't bring myself to do it. The gist of it is that I haven't been feeling great since before the Holidays last year. I ended up in the ER the week or two before Christmas with vertigo, shortness of breath, and abdominal pain. Everything checked out ok for the most part. Just some minor things that I've since addressed. I started feeling ok a couple months later, but never really got back to myself. Fast forward a couple months and I end up with an ear infection (haven't had one since I was a child), and was put on antibiotics for weeks. I actually hate going on them because of all the things they can do to your gut, but the pain was bad and I couldn't hear out of one ear, so there was no way I was chancing anything. Shortly after my second round, I got Shingles. And everything went downhill from there. After being on antivirals and my shingles started to clear up, I really got sick. My throat swelled up and felt like I had the worst case of strep throat in my life. Every lymph node in my body swelled. I had headaches, vertigo, shortness of breath, heart palpitations, could barely get out of bed and was the most sick I had ever been in my life. The Doctors didn't know what to make of it and with all the questions they were asking me, with a tiny bit of fear in their eyes that they couldn't hide, I knew Lymphoma was on the table. Luckily, that was not the case!! However, since I had been reading Medical Medium on my holiday break, Epstein Barr came to the front of my mind. Thankfully, the Nurse Practitioner I see is amazing, and after pressing it, she added an Epstein Barr panel to my battery of tests. It turns out, I was correct. I had Mono in High School, so I knew I had a past infection, which did show on the panel, but I also had a current active infection as well, which seemed to turn into Mononucleosis. And before you think that you can't get Mono twice, or even shingles twice, you absolutely can - I'm living proof of that. Armed with a wealth of information from Anthony William (the Medical Medium) I started on his food and supplement protocol. I eliminated all of the virus-feeding foods, and took most of the supplements or teas he recommended - Berberine, Monoluarin, Oregano Oil capsules, Vit C, and my typical vits, and also Lemon Balm Tea. I got my infection mostly into remission. I say mostly, because as of late, I'm not feeling well again and I don't know if it's due to the infection being mildly active or from the damage it's done. Constant exhaustion, headaches, hair thinning and loss, and weight gain isn't fun. Which brings me to the purpose of this post. The part where I feel sorry for myself, as well as anyone else out there battling chronic invisible illness. I mourn for myself. I mourn for the old me. The woman, who just a year ago, was able to run 30+ miles a week, and was able to do plyometrics and lift weights several times a week, every week. The me who was in the best shape of her life. And now, I'm lucky if I can even come home from my part-time job and do something other than getting in my bed for a nap. I'm sad. I'm angry. And I don't know why things like this happen. I've always been a person that is passionate about health. It's just not fair. But I know deep inside that I'll figure it out. I'll rally and start making appointments again, start getting all the tests done, and I will get to the bottom of it. I'm thankful that it wasn't something worse. My heart breaks for anyone that has major health battles. I know how this feels, I can't fathom something worse. And at the very least, I hope my story helps someone going through the same thing realize that you aren't alone. There are many of us with these viral issues and with autoimmune diseases that they cause. I hope that any bit of information, from the things that I did to get better or just sharing my story, could possibly help someone else. If you are someone struggling, I strongly suggest you read Medical Medium. Anthony is not your average Health advocate. However, he knows his stuff and I've done the research to back up every bit of information in his books. Even if you don't follow his entire protocol, the main points being followed like I did, can be a huge help. Push for the tests you need, research optimal results (not just the lab results), and be your own advocate. I can't stress this enough! I hope you don't mind me feeling a little sorry for myself. Some days it's just not easy. But I'm thankful for the self I do have and I'm hoping this all will pass some day. Just know, if you are going through something similar - I'm here for you. Leave me a comment, reach out to me on Instagram, or shoot me an email! There's strength in numbers and we can support each other! Hey Lovelies! I can't believe my last post was October!!!! Where does the time go?! I know, I know.... I always start my posts off that way.... But in all honesty, it's been a really rough year. I came down with my second case of shingles last week, after a really really long run with severe stress. The crazy thing is that I wasn't always such an anxious person. Many years ago, I was. But in the last several years, I was pretty zen. I never got stressed out over anything and was basically a living yoda. So what happened? Life in all its gritty glory is what happened. In January 2017 my Father in Law was diagnosed with Lung Cancer, and to say it rocked our world is an understatement. That year was such a blur of heartache, sadness, and stress, that I almost forgot anything else that happened in that period of time. Add in every day life stresses - raising a teen boy, financial commitments, vet bills, things in the house crapping out, then you just have a recipe for a nervous breakdown. I don't think I ever got to that place, but I got close. Anyway, I think so many months of constant stress just took it's toll on my body and I came down with a really bad case of shingles. So bad, in fact, that I've been on bed rest this entire week. And what do you do when you're on bed rest? Other than catch up on reading and Netflix bingeing, of course. You think. And you think a lot! So I've been thinking about the last couple weeks and this blog and really just pondering what I'm all about. This is where I get real, get raw, and get honest. Going through what I went through, what so many people go through every single day, really puts life into perspective. Recently, I had some conversations with some friends on Instagram about being a Purist. If you're not entirely sure what being a Purist is, it basically means someone that lives their life completely chemical-free. Like nothing, nada, zilch. I am by no means saying there's anything wrong with this! Not at all. If this is what works for you, that's amazing!!! I once strived to live this lifestyle, but I realized that it just doesn't work for me. I may or may not have mentioned before that I'm a perfectionist. It's something that can serve me well professionally, but not well at all in my personal life or for my mental state. Years ago, I attended IIN, which I absolutely LOVED, and don't have a single regret about doing. However, the reason why I don't currently practice as a Health Coach is because of my perfectionist personality. I could never eat, sleep, and breathe Holistic Health. It would make me a very unhappy human. 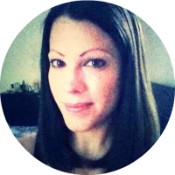 As much as I love this lifestyle, and know that I have a lot to give the world as far as helping others live a healthier life, I choose to try and do it through this blog. I tend to get obsessive with the lifestyle and am really working on balance at this point. For me, it's necessary for living MY healthiest life. Does that mean I don't recommend IIN or other programs? Absolutely not the case. That really depends on you and what you want in life and is really a whole other post. But if you're someone, like me, that tends to obsess and worry over every little ingredient, what it might be doing to you, etc, that might just be a "rabbit hole" you don't want to venture down. Just sayin. Recently in my quest to try out some conscious beauty products, I jumped the gun and got involved with a nail company. One of my biggest gripes is that when I paint my nails, it always chips off so quickly. Especially because I've always used many of the green beauty brands. Think 100 Percent Pure, Pacifica, etc. My little digits have been looking rather haggard lately, and it finally drove me to try something that wasn't completely up to my standards as far as ingredients. But being that it was 8Free and 1 ingredient shy of being completely clean, I was ok with this, because it was such an innovative product and solved a lot of issues for me as far as painting my nails. After doing what I thought was my diligent research, I jumped in, and starting using the product, starting a new Instagram account (which you won't find now because I deleted it), and even recommending to my inner circle. When the product was on my nails, I loved it. I ignored the sensitivity in my nails, the rashes I was getting when I scratched my skin with them on, and the irritation I was getting on my fingers. I thought "I haven't used anything but Clean nail polish in years, maybe I need to adjust". Until I started reading about many others experiencing the same exact thing. Have you ever gotten so excited about finding something new and something that you thought was really this great thing that you kinda whisper to the world about it, and ignore that little inner whisper inside you telling you that it might not be a good idea? Yea, that happened. I'm a human, what can I say. I make mistakes. But I will never ever compromise my moral standards or integrity and recommend something to any of you that I wouldn't use on myself, or on my own family. On this occasion, I may have been a little late to the party as far as listening to my inner voice. But I realize now, and can promise you that moving forward I won't jump the gun on myself. I can't always promise pure, but I can promise safe!!! I'm not here to bash any companies, and I recognize that this product might be ok for many others out there. I just happen to be one of the many that had an issue, unfortunately. And because of that, I cannot recommend them to you! This will always be a place where I share my healthy & SAFE options, but will never be place for preaching purity or making anyone feel inferior for their lifestyle choices. I may have been guilty of coming off this way in the past, I don't know. If I have, I apologize. I just want to help others live a healthier lifestyle. Whatever that means for you. Oh, and if you have any recommendations for a good "green" nail polish that doesn't chip off after days, please send them my way!!! 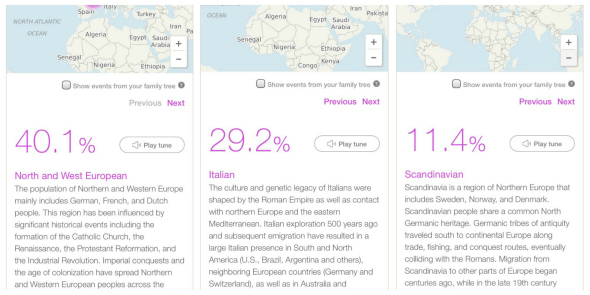 I don't know if I've mentioned on here in the past, but I am super into Ancestry. A couple years ago I did a trial on Ancestry.com and traced my family history on one side all the way back to the 1500's! Crazy right?! That side of my family was actually Mennonite (big surprise! ), and went back to parts of Europe that I had no idea were even in my background. Fast forward to a couple months ago, when MyHeritage reached out to me to see if I wanted to try their Genealogy DNA kit. Obviously, I was stoked and jumped at the chance, of course!!! What is it exactly? 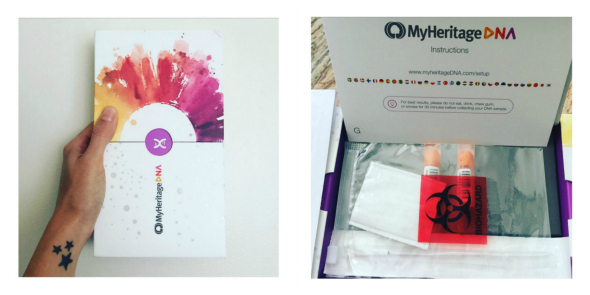 It's a kit that the company sends you with 2 swabs, one for each cheek. You register your kit, swab the insides of your cheeks and send it back to them. Then you just wait for the magic to happen. Since I had been working on my Family Tree again this past summer, I was pretty familiar with some of my lineage. So I was really curious to see how the results would compare to what I already knew. I got my results about 5 weeks after I sent them in and they did not disappoint! As you can see in the pics above, it shows the percentage of my DNA from certain regions and then goes on to tell you the countries that might be included in the results. This is a bit broad and I wish there was a bit more information provided, but it's still really cool! This did not bother me at all, as I already knew the specific countries included from my Family Tree background. It was still awesome to see exactly how much of a percentage of each region is in my personal lineage. For example, I had always thought I was more Irish than Italian, but it seems that Northern/Western European and Italian is the bulk of my background. So the bottom, line.... Would I recommend this test? If you are really familiar with your background already, you might not have the need to do this. However, if you want confirmation, or if you're adopted or not sure of any information from a whole side of your family, this would be amazing! 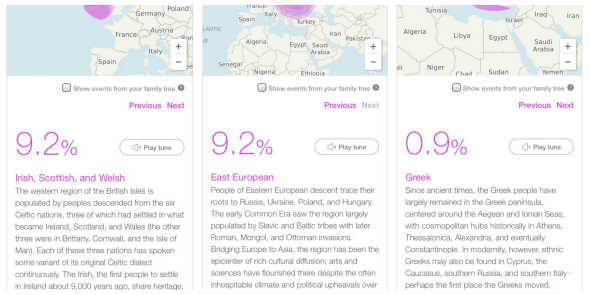 Or if you're someone like me, that just likes to geek out over ancestry related info, you would love this! Another cool feature that I discovered this past week.... If there is anyone else in the database that has had a DNA test done, that matches your DNA, the company will email you their info, as well as the way you might be related, i.e. 4th cousin twice removed, etc and give you the option to contact if you're so inclined to do so. Pretty cool, right?! Have you ever traced your family tree back far? What about a DNA test? I would love to hear about your personal experience! Genealogy is so fun!!! ps - The company is offering 30% off all kits until October 16th! That makes the test $69, instead of $99. I do not compensated for this, I'm just passing the info along, since that's quite a bit of savings! If you do the test, let me me know! I would love to see your results! DISCLAIMER: I did not receive any financial compensation for this post. This post does not include any affiliate links. However, I was provided a kit as a PR sample,. in exchange for my honest review. As always stated, all opinions are my own and have not been influenced in any way. It's been quite a summer! Some good, some bad. Mostly bad.... But I'm trying to look towards better days and move forward, not dwelling on the sad/hard times. I'm ok, my family is ok. But we suffered a tremendous loss a few weeks ago and it's been really difficult, to say the least. I wasn't even going to mention it in this post, but I had these grand plans of starting to blog more, doing more reviews, posting more recipes, etc. Losing a loved one really changes things. It knocks you off kilter, makes you see things differently, and start to question everything in your own life. At least it has for me. But I know that I really love my blog and want to put more time into it. So hopefully all of you are still out there reading from time to time! I have been on the serious hunt for really good, preferably organic, antiaging skincare. And I've found a few great products that I've really been loving! First up, this oil (shown above) is the first ever oil I've ever been able to put on my skin and not break out! Got it? First Ever! I've tried A LOT of oils and this is one of the best. 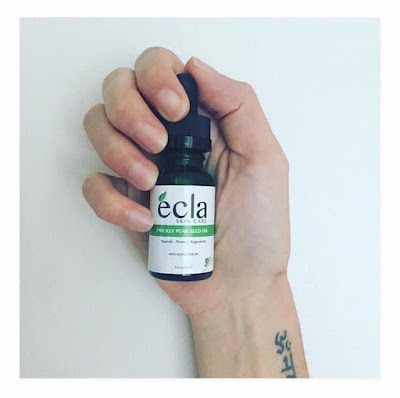 Prickly Pear Seed oil rates zero on the pore clogging scale and has so many amazing benefits. I initially purchased it to replace an eye cream. I have tried so many eye creams and nothing was working for me. I was starting to get crepe skin that just seemed so parched no matter what I put on it. And lets not even talk about the darker circles that wouldn't go away! But this oil has helped my eye issues so much!!! One drop, seriously, one little drop shared between both under eyes at night has made huge changes. The next product is one that is not organic, or even completely clean, but after seeing a Facebook Ad, I was intrigued. Plus I had a credit to use and have been in desperate need of a multi-use cleanser. Let me just tell you, I typically don't like cleansers. I've been using Facial soap for years. I know.... soap on the face, even "facial" soap is supposedly really bad, but I just couldn't part ways. My first love was Osmia Organics soap (I professed my love here) and then I found Skin Owl's matcha beauty bar - my skin loooooooves green tea. Like seriously, loves! And since cleansers always seem to dry me out or break me out, I thought this one would be joining the ranks of the many that haven't worked for my skin. So I ordered it, tried it and loved it. I can't even describe how wonderful it is. 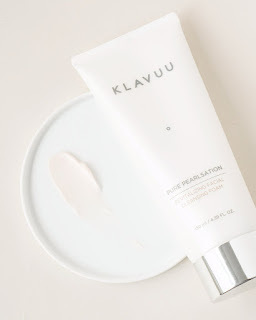 It's a Korean Skincare brand called Klavuu and it's like a combo of an oil cleanser/foaming cleanser. It's a bit on the pricey side, but a little goes a long way. You only need about a pea sized amount. And just turns into this gorgeous, luxurious, nourishing treat for your face. I've noticed a huge improvement in my skin. It looks brighter (hello pearl! ), is more hydrated, and my pores appear a little smaller. I'm currently using it twice a day with my clarisonic. Like I said, the ingredients aren't perfect, but it's not super toxic either. And as long as it's doing my skin good, I'm not so strict on being 100% clean these days. Not only am I a major Netflix bingeaholic, but I also love to watch shows when I'm on the treadmill. I'm usually outside, but on the days that I can't get out - due to rain, heat, or my schedule, I like to prop up my tablet and put on a good show. 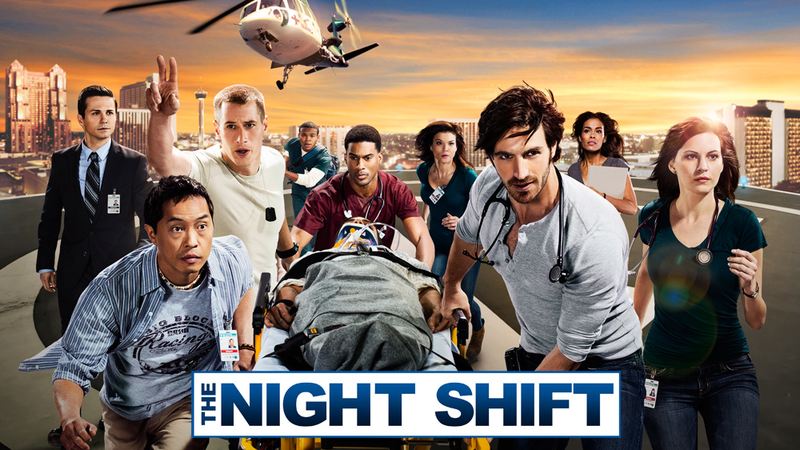 I've been so into this series called The Night Shift! I watched one episode and I was hooked. The acting isn't super stellar all the time, but it's the perfect workout show. It's fun to watch, keeps my attention and it's 45 minutes. Perfect! Another show I've been loving is Ozark. I know everyone has been buzzing over this one! I'm only 2 episodes in, so I need to catch up a bit before I come across a spoiler!! What's your fav binge-worthy show?! I have to be honest. I haven't read anything that has blown me away this summer. But I have read some decent books. I typically like to sit and read on my tablet while I blow out my hair in the morning. Blowing out my hair is not one of my favorite pastimes and reading while I do makes it a little more bearable! A few fiction books I've finished over the last couple months are - Remember Me this Way by Sabine Durrant, I'm Thinking of Ending Things by Iain Reid, and The Light We Lost by Jill Santopolo. All 3 were just ok for me. The first one I mentioned is the only one that had me wanting to constantly read to find out the twist. But there wasn't really any crazy twist and it was really just a ho hum ending. Don't you hate that? When a book gives so much build up and it feels like there's still so many questions. Or worse, it just drops you flat on your face. I'm currently reading The Sinner, the same book that the new USA limited Series with Jessica Biel is based on. I'm dying to find out what's going to happen. I'm just hoping the ending isn't lame. It's pretty disturbing so far! So that wraps up the latest products and things I'm loving. I would love to hear what you've been using, reading, watching, etc! Make sure to let me know in the comments!!! DISCLAIMER: Please note that while this is not a sponsored post, it does contain some affiliate links. Popsugar kindly provided me with a sample box for my review. However, I was not financially compensated and all opinions are my own. Hi Lovelies! I can't believe it's almost July already! With the hot weather, I've amped up my health & fitness routine to prep for shorts. Part of that is continuing to do BBG, but the other part has been really fine-tuning my eating even more with a food scale. I already track my macros, but I know that if you're already on top your food consumption (meaning calorie amounts, macros, and such) and not losing fat, your serving sizes can be more than you realize. If you tend to eyeball like me, you can really underestimate how much you might be eating. This can make a HUGE difference! I know with myself, if I'm not on point with my meals and staying on top of sugar and grain-based carbs especially, the weight can start creeping up again. So that's where this nifty little food scale by EatSmart comes in to play. 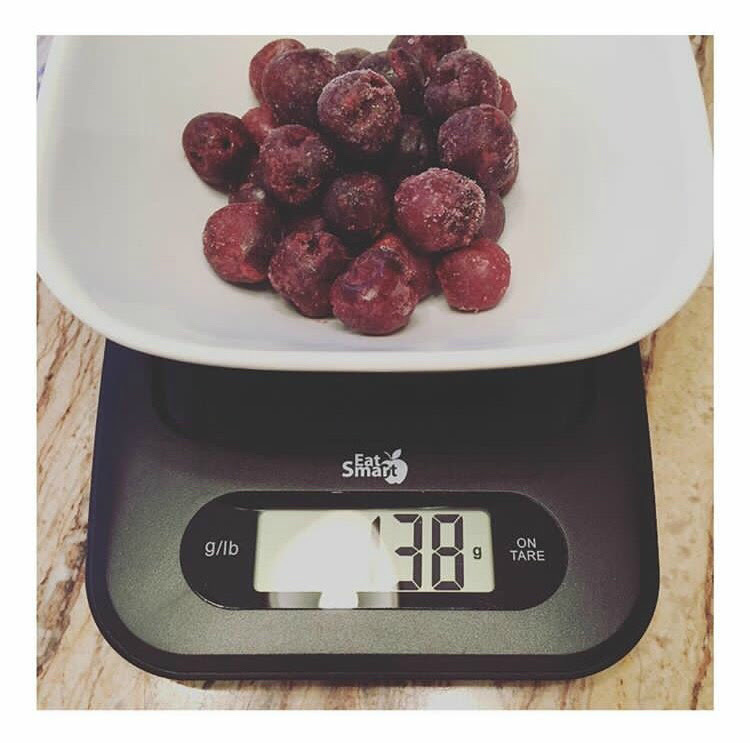 You can choose to weigh food in ounces or pounds, and you can also weigh food on a plate or in a bowl, without the weight of the container effecting what is shown. I've been using it daily for the last couple of months, and it has helped me tremendously. I was absolutely eating more than 1 serving amount of food and without a doubt it was effecting my results. Case in point, I've been eyeballing pistachio servings lately. But today, since I'm really cutting again, I decided to break out my scale. Whoooooooaaaaa!!! I was eating at least twice the serving size of pistachios because I was using the cup amount on the nutritional info. Yikes! That just goes to show that it's easy to get comfortable with feeling like you "just know" a serving size, and also why Intuitive Eating doesn't always work for everyone. This scale is a great price point as well. If you've been struggling with fat loss and clean eating with a good fitness routine in place, I highly recommend giving this food scale a try! It might just be the missing piece to the puzzle that you need. Ps - It's also on super sale right now on Amazon!!! Make sure to check out EatSmart on their Social Media channels. They make some other really neat gadgets! Check back soon to find out who makes my most favorite protein ever!!! ** while I received no financial compensation for this post, I was provided a scale in return for my honest review. Human Magpie, Fitness Obsessed, Health Nut blogging about my latest Style Favs, Healthy food finds & recipes, and Clean beauty. 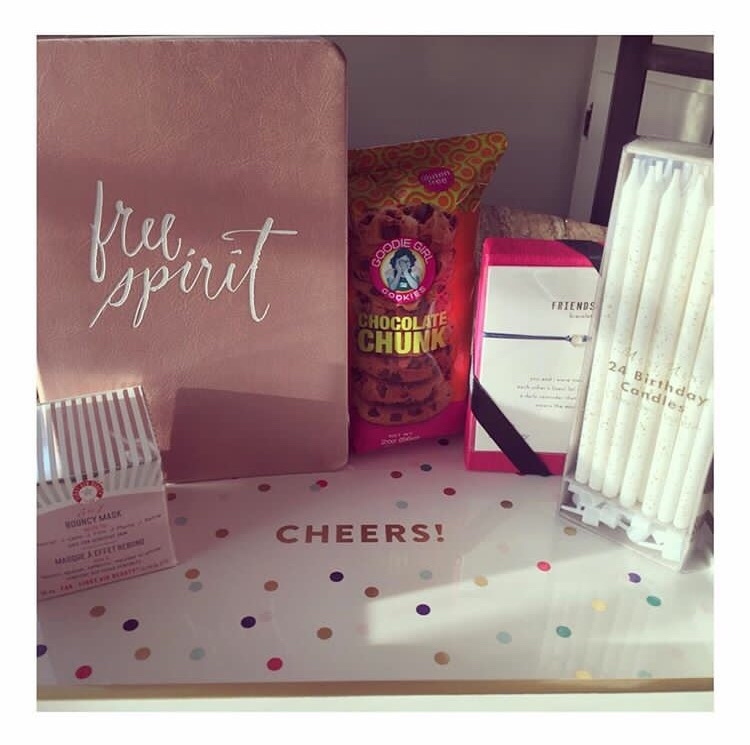 I love collaborating with brands for reviews, giveaways and more! Please note... I only work with like-minded brands and absolutely will not review any beauty, wellness, or food products that contain toxic components! If you think we would make a good team, feel free to contact me by clicking on the Email icon above! All Reviews or Posts regarding specific items on this blog are my personal opinions. Unless otherwise stated, I do not receive compensation for these posts or reviews. Sparkles & Spinach 2008. Powered by Blogger.